You Are Making a Difference with Whispers from the Wild Ones! 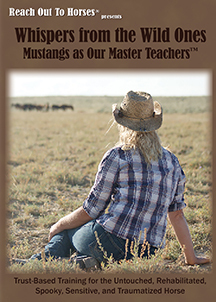 Reach Out to Horses is excited to report that, with your help, we’ve been able to send 127 Whispers from the Wild Ones: Mustangs as Our Master Teachers, DVD’s to non-profit organizations and governmental officials all over the U.S. and beyond. But we’re not done yet. In the coming months we will be sending hundreds more to deserving organizations making a difference in the world for all our equine companions. To find out how you can lend a hand or if you have an organization you would like to suggest, go to reachouttohorses.com/dvd.html#wow. In the meantime, enjoy perusing through the list of organizations who have already received this groundbreaking program. Double HP Horse Help Providers, Inc.
Twenty-four Wild Horse & Burro Programs & Associations and the Division of Wild Horses and Burros. Previous postMeet Marvin and share in his journey to wellness!